This puzzle featured on the 1 Across ‘Newbie corner’ before we moved over to this forum. 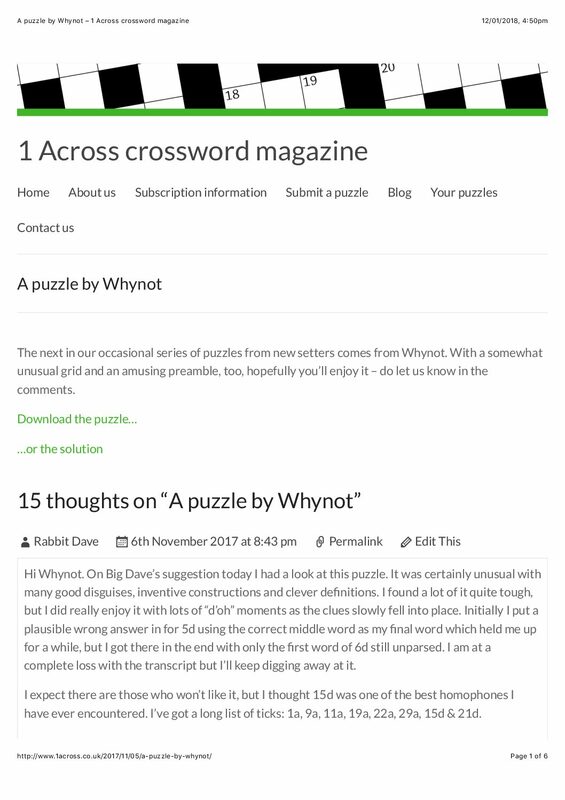 Included here are PDFs of the puzzle, solution, and comments received. I gave this one a start yesterday evening, and after half an hour or so of wrinkling my brow, I got to the “penny drop” moment which was very satisfying and funny. About halfway solved, more thoughts to follow! Since I’ve demanded a downloadable solution up front from others, and I notice the solution for mine didn’t make the transition from Newbie Corner (that was) to Your Puzzles, here is the filled grid. I can supply a pdf of the explanations too, if needed, but I believe Hamish has a neater version (as made available at the original location), so unless there’s an urgent demand for explanations, I’ll leave it to him to put that up in due course. Doh! Sorry, Hamish! Just noticed the solution is one line below the puzzle, above. Please delete these irrelevant posts if it’s not too much trouble. Cheers! Just finished the transcript, admittedly with some help from Wikipedia. 5d gave me a way in, and from there I got a couple of the others, but had to resort to electronic help as it is a subject about which I am woefully ignorant! It was good fun and cleverly done, and I learned some new things about the topic. As for the crossword itself, I had far fewer problems. I got the NW and SE corners in pretty quickly, then struggled a little with some of the longer central clues. 11a I got it from the down clues, but still do not understand the ‘handle’ part of the clue. 30a didn’t understand how ‘showing sights to’ is a definiton for the solution. And also wondered if ‘the’ could have been omitted in clue for 5d as it appears in the answer. Anyway, congrats on a job well done. Looking forward to your Rookie corner offering in Feb, and hopefully more stuff here. Thanks for the feedback, Brendan. I needed Wikipedia myself! It’s not something I knew much about, but a subject dear to the heart of Alberich, at whom it was originally directed (more about that in the Newbie Corner comments bundled in a pdf above). 11a is TAN (bronze) + H (handle’s primary) = TANH (hyperbolic tangent, a function). In 30a, “showing sights to” is a Chambers definition of the word, whose origin lies in the fascination with the stone lions of Trafalgar Sq (London) when first erected as items of interest to show visitors to the capital. I did wonder about “the” in 5d. I felt it was an integral part of the answer, though, and needed a “the” in the clue to account for it. Well done for successfully persevering with the solve. The upcoming Rookie will be much gentler. Ah, I had the wrong sort of letter in for 4d (Greek rather than Norse) and so the wrong sort of tangent for 11a! Now it makes perfect sense. Thanks for the clarification and the interesting definition for 30a. Glad you’ve “seen the light” now, Brendan. 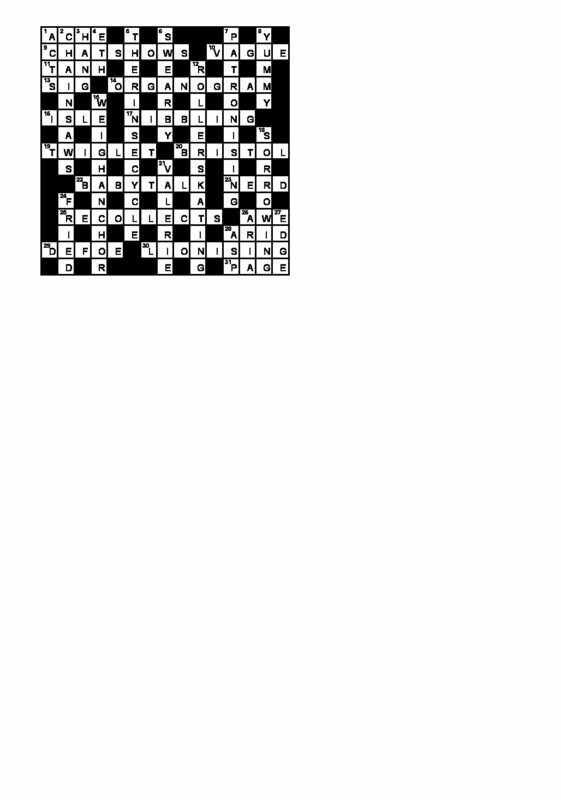 There is a Word file for download just underneath the puzzle pdf (where I didn’t notice it myself at first) giving full solution with explanations. Thanks again for this one Whynot, which is enjoyably unusual in the grid and the task, with some delightful clues along the way. An epic work, you might say. It’s more up the difficult end of the scale, certainly, and sad to say I didn’t quite get there: without help from the Chambers app feature that checks against crossing letters, I was short six grid entries. With help I got that down to one (29d). I also couldn’t puzzle out the first two blanks in the tickertape – I hadn’t twigged that “Beirut” might be mangled in the same way “cods” was, even though the latter had clued me in to the penny-drop, so I was thinking about modern-day Lebanese connections to a subject I’m very shaky on in any case. The clues range from medium to testing, but are very thorough and fair (have a few nitpicks/things I couldn’t parse below). As the definitions are often cryptic, and don’t “jump out” as a certain part of the clue, that helps to raise the overall trickiness. 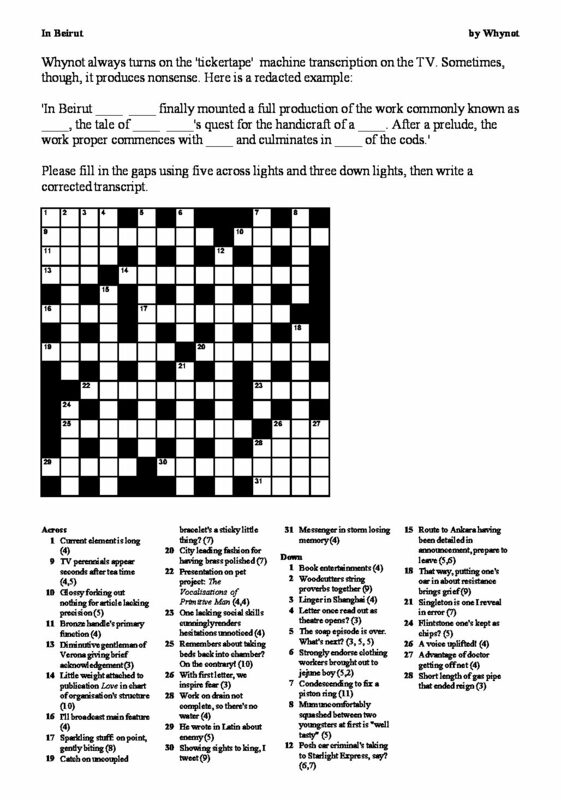 Favourite clues, mainly for the pleasing surfaces, were 13a, 17a, 19a, 25a (satisfying to piece together), 28a, 1d, 21d (lovely defn), 24d, 26d (great &lit) 28d (tough but inventive defn!). 5d was the real groaner and confirmed that my little spark of suspicion about the theme was right. 20a – I get “city leading fashion” but I’m blanking on the second part of double def. Missing something obvious?? 30a – thanks for the post above, I’d missed that story in Chambers and it’s interesting! 6d – jejune changes boy to BY? Chambers gives “spiritless”, if that’s the intent I’d probably say it’s a bridge too far for my tastes. 12d – I love the cheeky device of anagramming “s taking” but as it’s only two letters swapping, it doesn’t quite seem “criminal”! 15d – just can’t get on board with this, pardon the pun. I don’t feel “route to Ankara” gives “WAY ANKARA” and “detailment” makes things muddier. Is “anchor” really a homophone for “ANKAR”? The clue does get you there, but didn’t quite feel fair. Anyway, that’s my “praise or grumble” as BBC Radio Sheffield puts it, hope it’s fair and useful. It’s a great theme, and I have a personal example of the “tickertape” that remains a favourite. Watching George W Bush talk about the Iraq war, the captions rendered “General Petraeus” as “general betray us”, which seemed fantastically unfortunate. Thanks for your appreciation and valuable feedback, Joeplus. For me, the art of cluing is in interesting surfaces with unusual ways of looking at things and certainty in the answer once solved, so your remarks are (mostly) very pleasing. To be frank, it ought to be a good puzzle because apart from any skill I may have brought bear, it received the attention of two pro setters (serially, not in parallel) and developed to its final state with much criticism and encouragement from them. I’m really sorry you couldn’t finish even with Chambers’ help. You said 29d, but I think you must have meant 29a (the writer). It’s not good, because there are only two checks in five and they’re both vowels. A personal friend who tried it also got stuck on that, so mea culpa; I have failed in your cases with the setter’s task of losing gracefully to the solver after a struggle. The theme is actually not a pet subject of mine, but the setter Alberich’s (the clue’s in the name), the first of the above-mentioned, who saw a very bad early form of the puzzle. 5d, as you may surmise, was where it all started, closely followed by 17a. I needed Wikipedia to know pretty much what else to put in. Beirut was sly, eh? It’s the big misdirection the solver has impressed on him on first seeing the puzzle (that was the idea, anyway). I did wonder if cods was too obvious, so it’s interesting that it gave you your first inkling. Your favourite clues overlap heavily with mine! 17a, 19a, 28a and 5d are the shining stars for me. In 20a, “fashion for good order” might have been fairer, but I couldn’t resist the smutty overtones of “brass polishing” having read Collins’ definition. In 6d, my old (7th ed.) paper Chambers has empty before spirited, which I relied on. It’s not a word I think I’ve ever used in the wild. It’s from Latin for hungry, so I think empty is primary. 12d Heh! Heh! Possibly only a civil ofFence? I’ve noticed commenters elsewhere don’t like indication of anagrams when the rearrangement can be expressed as “cycling”, say or a reversal. Still, I liked the image of the crook in the Roller going to a musical. Actually the “cheeky device ” you liked only just scraped by with Alberich. Not one for the Times, I fear. 15d I understand your reservations. It is a little awkward, a bit like a slightly ungrammatical sentence where (crucially) you know what’s meant. For me the homophone is perfect (in as far as one can have a correct pronunciation for a part-word), but others might speak properer than what I do? In fact, it was “favourited” (favoured?) by some others and Rabbit Dave, in the bundled comments, called it one of the best homophones he’d come across, while admitting others would probably differ. You can’t please everyone at once, it seems. “General Betrayus” is a classic of the genre. Thanks for that! My own favourite, which I saw on BBC News is “the ex-Yugoslavian President slobbered on the loss of rich”, while our esteemed editor, Hamish has (also in the bundled comments) noted “the lifeboat Grey Starling” for Grace Darling. This was intriguing and funny, Whynot – many thanks! My favourites were 16a, 19a, 28a and 5d for their neat/plausible surfaces. Did you consider a definition in 14a that has less of an overlap with the answer? In this case it’s tricky to achieve, I know. It was clear enough what 23a would be, though I wondered whether the synonym for ‘hesitation’ can be pluralised. 26d going to come up with some more of these? 16a look out for them! Thanks, Trigon, glad you enjoyed it. I did consider some more cryptic definitions for 14a, but as it was an unfamiliar word (for me at least) I thought it better to have a fairly straightforward clue, in line with the adage “hard word, easy clue; easy word, hard clue”. For 23, how about: “His speech wasn’t very fluent. It was full of ums and ers”. No dictionary support for that, I’m afraid! Alternatively, you could say the s in the word play is the s of hesitations and the synonym replaces the part before the s. (That should rattle Ximenes in his grave, I imagine). Seriously, it’s a reasonable point you make, but not one anyone else has raised, thankfully. After picking it up and putting it down for about a fortnight, I managed to get most of this cracked…but had to peek at the solution in the end. A great challenge, Whynot, I really enjoyed it. 17a had my ‘spidey senses’ tingling, quickly followed by 5d. 21d was my favourite. The clues that I couldn’t parse are addressed in the comments above. I certainly need to bone up on the subject matter as it crops up so frequently in the cryptic world. Thanks, Wire. Glad you enjoyed it and sorry you didn’t get the satisfaction of completing it. 21d wasn’t universally popular, since the answer was one you either knew or didn’t, but I think it’s a good clue if you are of a certain age living in the UK. Maybe the song would have been a better-known ref, but it seemed to clash with the theme. As for the main topic, I read a Guardian setter’s comment on a fifteensquared blogpost that the editor doesn’t accept any references to W. Not sure why.